The following work expanded the Sunlight Foundation’s brand through a variety of mediums. We had to ensure these brand extensions were true to our style and cost effective. 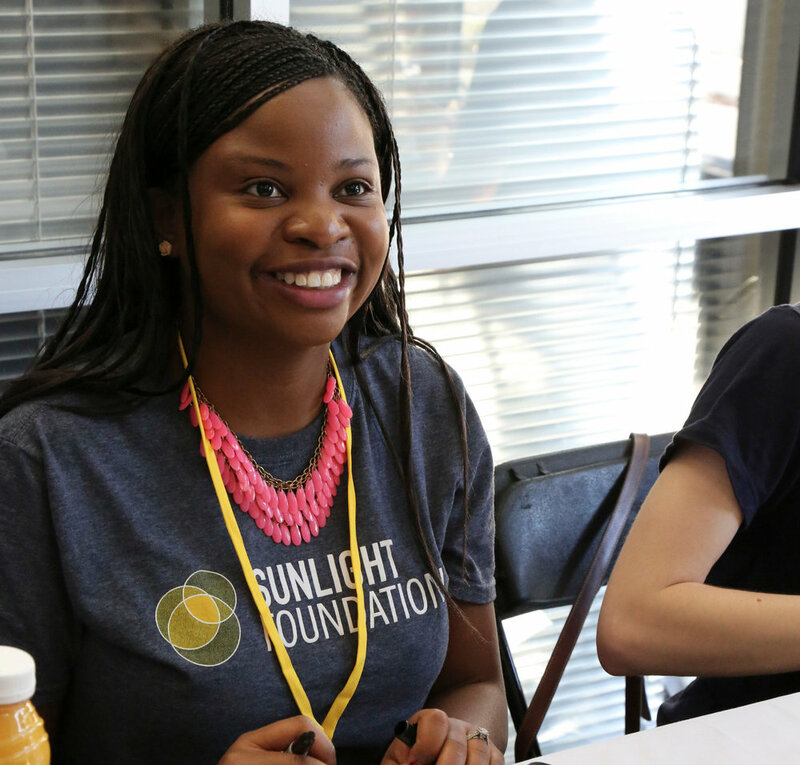 The Sunlight Foundation lacked cohesive staff shirts to wear at events such as hackathons or conferences like PyCon. Wearing the branding of the organization sparked interest about the foundation. Finding a shirt that our developers would WANT to wear and look good in was one challenge. We picked Gildan Softstyle Jersey in Navy Heather for its comfort factor and stain-hiding abilities. The poly/cotton blend offers a soft stretch feeling without losing its shape. They are also semi-fitted, so they better fit females and don't hang like squares on men. Another challenge was converting the nine-color logo to something that was easy and affordable to screenprint. Each section of the circles was converted to halftone then colored. There was a lot of back and forth with the vendor about the appropriate dot ratio and size. Positioning the logo on the shirts so it looked good on both men and women also required a lot of testing. Sometimes the Sunlight Foundation staff needed to attend or speak at formal events, so I created lapel pins to add some luxury branding when the team couldn’t get away with wearing a T-shirt. The pins are a simple and elegant way to identify belonging to the organization. I also designed buttons that the organization could give away as promotional items during its events. They use Sunlight’s logo and colors, or feature the “unlock the capitol” symbol from the TransparencyCamp logo. Part of being in the tech sphere is having cool stickers—some are so cool that they don’t even include words. But the Sunlight Foundation wasn’t well-known enough for that, and sought to spread its message to a wider audience. I started thinking about how part of Sunlight’s mission is shining a light on the government. The result is a design that illuminates the Capitol building when covering a Mac laptop’s logo, highlighting our mission of transparency in government. Creating branded, simple, and readable e-mails was a huge priority for the Sunlight Foundation. With a new CRM system and more-mobile audience, I decided to create a holistic email template system. Each email needed to work as a set, yet accomplish a slightly different task on its own. They work as a family in terms of structure and color. The flexible templates could be tweaked to serve most email needs, and used a single-column structure that worked well on mobile and troublesome clients such as Outlook 2007.